The legendary saxophonist John Coltrane worked in bebop and hard bop jazz before moving to the modal form and then into the free jazz movement. He produced at least 50 of his own albums during his career as well as appearing as side man on other albums (including with trumpeter Miles Davis and pianist Thelonious Monk). In 1957 he released his solo album "Blue Train" and played on Miles Davis' album, "Kind of Blue". In his modal jazz period, he released the albums, "My Favourite Things" (1961), "Live at the Village Vanguard" (1962), "Duke Ellington and John Coltrane" (1962) and "John Coltrane and Johnny Hartman" (1963). In 1965 he released the spiritual album, "A Love Supreme". In hi s free jazz period, he released the album, "Ascension" (1966). 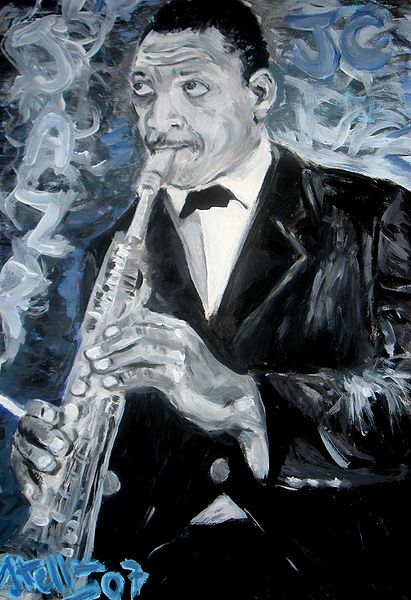 A 2007 portrait of John Coltrane by Paolo Steffan. 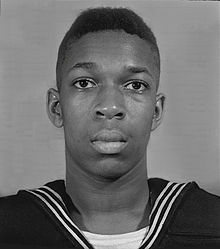 United States Naval Reserve portrait of John Coltrane. John Coltrane as portrayed on a 1996 United States commemorative stamp in the American Music Series. Note: This picture gallery page includes drawings, paintings, photos and images of performances of John Coltrane.